A Thug Tried To Carjack An Armed Senior. Wanna Guess What Happened Next? An elderly Oklahoma man passing through Sioux Falls (SD) was attacked by a man half his age who must have thought that a man 42 years his senior sitting in a car with the door open would be easy target for a carjacking. “The driver’s door was cracked slightly. While they were in there, what ends up being our suspect came along and pulled open the door and started punching the man in the head. Telling him to get out. He was trying to take the car,” said Sioux Falls Police Officer, Sam Clemens. What the suspect didn’t know was the 71-year-old man he was was hitting over the head was carrying a concealed weapon. The Oklahoma man sitting with his wife took a 38 caliber handgun out of his pocket and shot the suspect twice. 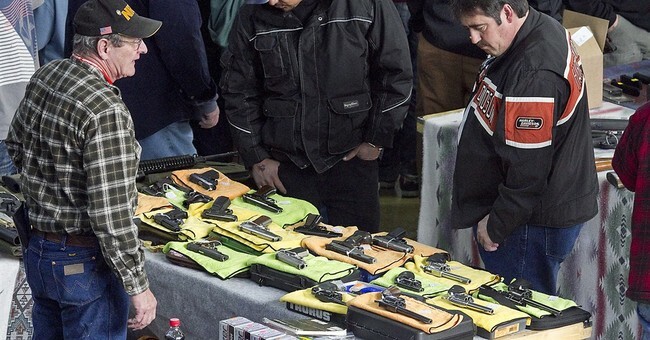 “There’s some type of reciprocity so if you’re issued a concealed weapons permit in another state, as long as there’s that agreement between the states, then you’re allowed to carry concealed in a different state,” said Clemens. The carjacking suspect, 34-year-old Edward Leblanc of Bismark, was found near McDonald’s on West 41st Street. He will most likely face charges of robbery and simple assault, once he’s released from the hospital. While this incident ended well enough, let’s not lose sight of why LeBlanc selected the older couple as a target, which was made more clear in the video report than the written version. The older couple were sitting in a stationary vehicle in a parking lot, with the driver’s side door of the car open. While the majority of nice normal people would think relatively little of seeing that, a criminal views a person sitting in a car in a parking lot—with the driver’s side door open, even!—as a flashing neon sign, screaming ROB ME. Parking lots are a transitional area, where you’ve neither physically protected by a structure (a home, business, or store), or the movement of a vehicle in motion. The average person is at one of their most vulnerable points when sitting in a parked car. You have no cover, limited movement options, and in general, are a sitting duck. There’s a reason that self-defense professionals tell you to keep your head up and on a swivel looking for threats when moving from a structure to your vehicle, and to get buckled in and on the road quickly. The goal isn’t to win a gun fight against criminals, folks. The goal is to avoid the situation entirely.